This week's Next 20 community builder is Dr. Thara Vayali, a naturopathic doctor, yoga teacher and founder of Change: Natural Medicine—membership-based health advising—and Pop Up Medicine—casual public events facilitated by health care professionals for the community. Dr. Vayali understands how creativity and curiosity play a necessary role in the way we express ourselves and communicate in our professional lives. For me creativity equals freedom. It's a space where I am free to explore without having to name it or explain it. Creativity is also a cycle as opposed to a linear process. I did my Masters in Environmental Education and Communications and as I was doing research for my thesis I came across this model called the seasonal approach to pedagogy. It uses the analogy of the four seasons to describe the creative cycle. Often we tend to get stuck in planning mode (Fall) and then jump right into production mode (Summer) and don't allow time for our ideas to incubate (Winter) or allow time to explore the initial sparks of ideas (Spring). Understanding the creative process as a cycle really resonated with me. As I was working on my thesis, I found that in some parts of my writing and research I would be in gestation mode and in other places I would be in full production mode and it just made sense to allow my process to unfold in this non-linear way. Creativity allows me to break through the mould of what I am supposed to do or who I am supposed to be and allows me to feel a sense of autonomy. As such, my career is multi-faceted—I am a naturopathic doctor, a public health educator and a yoga instructor. Having different dimensions to my career gives me the wiggle room that I need to truly express myself. Boredom. Though I don't think that's quite the right word, as I don't mean simply sitting in a room and doing nothing. I mean having space and unstructured time to give your creativity a chance to come through. When I find that I have something within me that needs to come through, I will try to clear time in my day and it may be that I spend time baking or cleaning my house—the idea is that I schedule in some unscheduled time to allow my creative process to happen. Our own self-doubt and self-judgement has a huge impact on our ability to explore our own creativity. 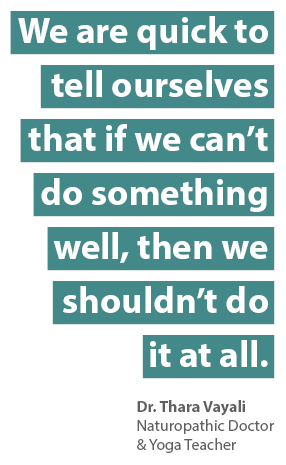 We are quick to tell ourselves that if we can't do something well, then we shouldn't do it at all. When we focus on perfection we become afraid of making mistakes. My father was a physicist and my mother was a librarian and growing up they both encouraged me to ask a lot of questions. And so I did! I'm sure all my questions got to be quite tiresome for them. It got to a point where my parents no longer had answers for me and so I had to go and seek out answers on my own. To this day, it's the things I don't understand that trigger my curiosity and make me want to know more. How to you see your profession evolving in the future? As a physician I'm expected to not make mistakes, which is impossible as I'm not a robot—I'm human. My humanness is what allows me to be compassionate with my patients, which is so important. Thankfully I've seen that the curriculum for medical students is changing to encourage young doctors to see their patients as more than just their lab results and diagnoses. I believe that medical technology alone is not serving our patients as well as it could. Patients need to be more patient with their doctors and not expect perfection. Doctors become better at what they do when they have mercy for their own shortcomings and learn from them. We are discovering that our mutual humanness is a beneficial aspect of care. What do young people need to thrive in the future? Young people need freedom and trust. I'm so inspired by my 13-year-old niece—she got her first iPod when she was 9 and the curmudgeon in me wanted me to see her parents limit the use of her device so that she could spend her time doing better things. But this is where my bias was wrong, as I have now seen how effectively she uses this piece of technology as her creative outlet. By watching YouTube videos she has developed her artistic practice and produces work that she sells at her school. And when it may look like she's wasting time on her device, I've recognized now that she's just in gestation mode. Many years ago, gestation mode might have looked like kids kicking around a ball in a field somewhere. It looks different now. If we give young people more freedom and trust I think we would be pleasantly surprised.